Many of us are striving to become more productive, whether that is to meet our own goals or to contribute more as an organisation or an industry. But what makes us more efficient and effective? And what holds us back? 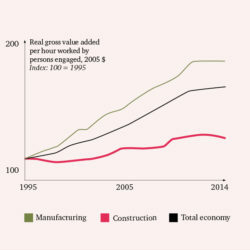 A recent report by McKinsey Global Institute (MGI) tried to answer these questions in its analysis of productivity in the global construction industry. It found that labour-productivity growth ‘has averaged only 1 per cent a year over the past two decades (and was flat in most advanced economies)’. This is even more shocking when compared with growth of almost 3 per cent in the total world economy and even more in manufacturing. So if the challenges faced by the construction industry date back decades, what can we do now to become more efficient and effective? As part of its research, MGI identified seven levers that, when combined, have the potential to raise productivity 50 to 60 per cent higher than the current level. Better procurement and supply-chain management is one of these key enablers to success. Our customers tell us that it is the high number of small contracts that are expensive to manage, and which lack data on delivery. By necessity, the focus has been on managing contracts £1M+, which often hold the greatest risk. According to MGI’s report, poor supply chain management typically accounts for 10-30 per cent of cost and time overruns. Building better and more collaborative relationships between clients and suppliers on smaller projects could help gain a few critical percentage points. The challenge is making this simple. Having good governance and transparency of information, at the same time as making it faster and easier to procure and deliver contracts. At Indigo& we’re working to solve this problem. Our cloud platform has been designed to help drive efficiency throughout the project lifecycle. It is a crucial step towards creating more productive and ultimately competitive organisations, which is good for us and for the economy.